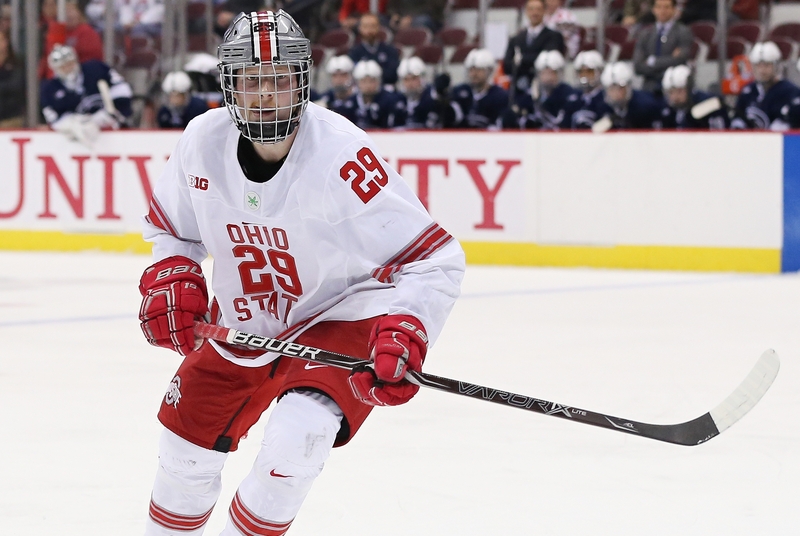 COLUMBUS, Ohio – The Ohio State men’s hockey team announced its team award winners for 2018-19. The squad was the Big Ten regular season champion and made a third consecutive NCAA Tournament appearance, finishing 20-11-5 overall and 13-7-4-3 in Big Ten play. Co-captains Mason Jobst and Sasha Larocque each were recognized by their teammates for the second time, as Team MVP and Best Defensive Player, respectively, and senior Brendon Kearney earned a second straight Unsung Player award. Gustaf Westlund was selected the team’s Rookie of the Year, sophomores Grant Gabriele and Tommy Nappier shared Most Improved Player honors and Larocque was also recognized with the Scholar-Athlete award. Jobst won his second Leading Scorer trophy. 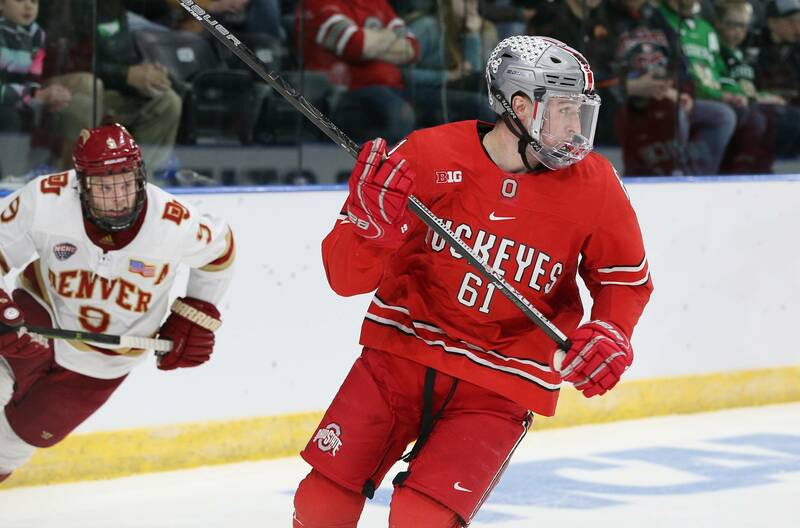 Jobst, a Hobey Baker Award Top 10 finalist, Second Team All-American and First Team All-Big Ten selection, was voted Team MVP for the second time (2017) and also won his second Leading Scorer award (2017). He is the ninth player to be voted MVP more than once. 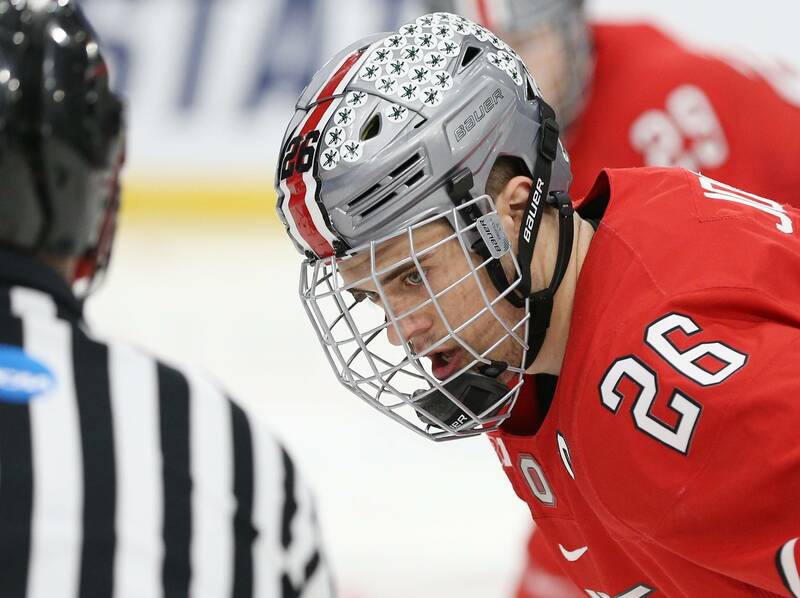 He led the Buckeyes with 17 goals and 36 points this season, ended his career 12th in OSU history with 164 points and as the conference’s all-time leading scorer in Big Ten games. His 3×3 OT goal at Michigan clinched the Buckeyes’ regular season title. Last week, Jobst was named one of five finalists for the Big Ten Medal of Honor, given to the top male and female senior student-athletes on each Big Ten campus. The Speedway, Indiana, native is a three-time Ohio State Scholar-Athlete and two-time Academic All-Big Ten selection. He agreed to terms on a two-year, two-way, entry-level contract beginning in 2019-20 with the New York Islanders following the season. Larocque was selected as the team’s Best Defensive Player for the second straight season and received the Scholar-Athlete Award. The Big Ten Defensive Player of the Year and a Second Team All-Big Ten selection, he was the leader of the Buckeye defense that ranked second in the Big Ten and in the Top 15 nationally, holding opponents to 2.31 goals per game in 2018-19. 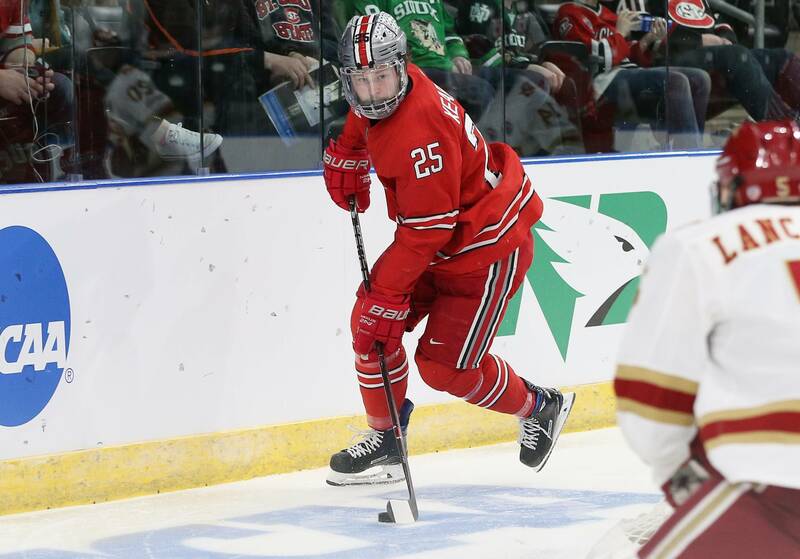 The Buckeye co-captain skated in 33 games in 2018-19 and had two goals, seven assists and nine points, along with 50 shot blocks and a +11 rating. He was a Senior CLASS Award First Team All-American, four-time Ohio State Scholar-Athlete and three-time Academic All-Big Ten selection as an earth sciences major. He received a Fergus Memorial Award postgraduate scholarship at the Ohio State Scholar-Athlete Dinner last week. Larocque, from Calgary, signed with the AHL Colorado Eagles following the season. Kearney, the Unsung Player award winner, is from Northville, Michigan and won the national Derek Hines Unsung Hero Award this season. The Big Ten Sportsmanship Award recipient for the Buckeyes, Kearney played in all 36 games and had a career-high seven goals, adding four assists for 11 points. He had just two penalties and led the forwards with 31 shot blocks. He earned his fourth Ohio State Scholar-Athlete honor and is a three-time Academic All-Big Ten selection. Kearney was named a Woody and Anne Hayes scholarship recipient at the Ohio State Scholar-Athlete dinner Wednesday. Nappier, who shared Most Improved Player honors, was the Big Ten Goaltender of the Year and a First Team All-Big Ten selection, as well as a Mike Richter Award semifinalist, and ranked in the Top 10 nationally in goals-against average, save percentage and winning percentage. 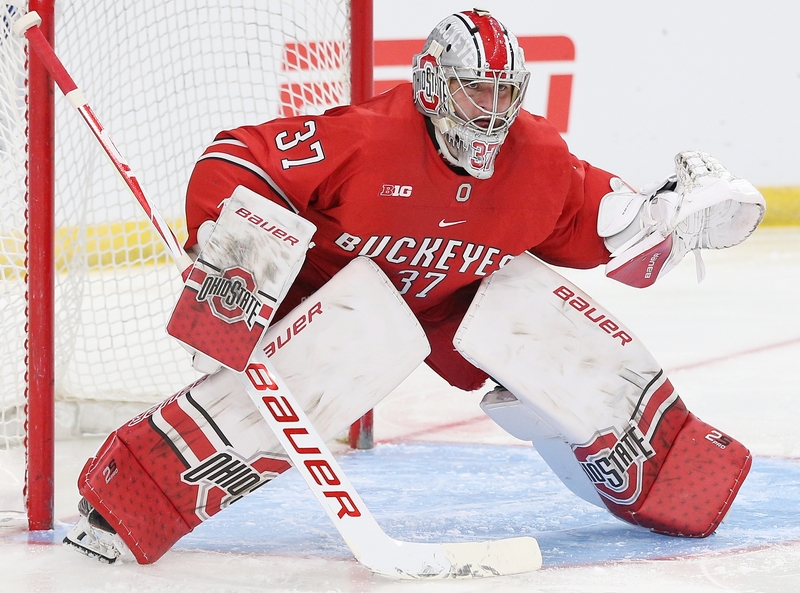 The St. Louis native ended the season with a 1.86 goals-against average and .934 save percentage, the lowest gaa in a single season in program history and the second-highest save percentage for a Buckeye in a single season. In Big Ten games, Nappier had a conference best 1.82 goals-against average and .936 save percentage, leading the league in winning percentage (.750; 8-2-2). His goals-against average was the second-lowest in Big Ten history, with his save percentage ranking fourth all-time. Gabriele, from Brighton, Michigan, skated in 24 games (including 22 of the last 23) after not making a regular season appearance as a freshman. He had a goal and three assists for four points, with a +3 rating and 12 blocked shots. Westlund, a forward and native of Stockholm, Sweden, was voted the team’s Rookie of the Year. A Big Ten All-Freshman Team selection, he had 19 points, with five goals and 14 assists, while limited to 25 games because of injury. He was sixth among Big Ten rookies in scoring overall and ranked second (tied) in scoring in Big Ten games only with 15, on five goals and 10 assists. He earned Ohio State Scholar-Athlete honors.